There’s a lot to be said for the power of pictures. 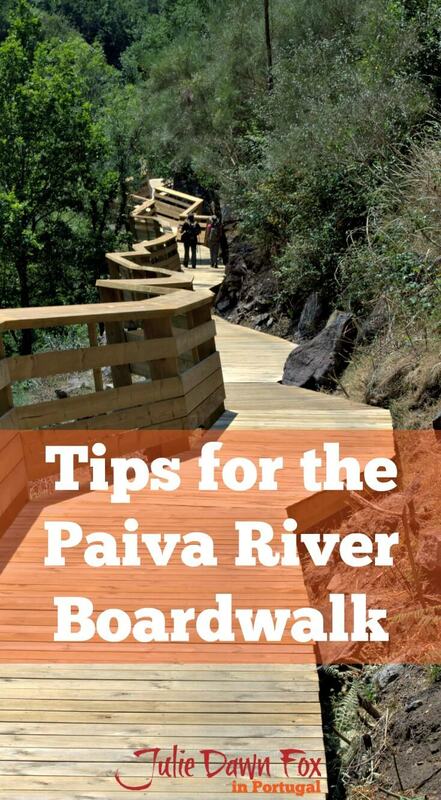 Images of the Paiva River boardwalk started popping up in my Facebook feed and spurred me into action. Just days after the official opening, a couple of friends and I decided that the 2-hour drive to Arouca Natural Park was worth it based on the photos we’d seen. We’re not the only ones who think it’s impressive – the project has gone on to win the World Travel Awards for four consecutive years. The Paiva boardwalk is not that easy! We had been intending to join a group of walkers coming from Porto but in the end, we decided to go it alone. Just as well, really, as we didn’t manage the entire 8 km walkway. Although some would argue that the Paiva boardwalk has had an overly taming effect on the rugged natural beauty of this part of Arouca Geopark, that doesn’t mean it’s a walk in the park in terms of effort. Fortunately for us, we started in the tiny village of Espiunca. I was so busy admiring the view down the river and taking photos that I didn’t see the information board until we got back. If I had been paying more attention, I would have spotted the big hill at the other end. As it was, we merrily walked along, coping easily with a few inclines and stairs and having every intention of reaching the river beach at the other end of the boardwalk. That changed shortly after we turned a corner and saw a massive hill. I innocently joked to my friends that we’d have to go over it. Then we turned another corner and saw the boardwalk steadily climbing up said hill. We began to have our doubts but it wasn’t until the next bend, when we saw the zig zag of steps leading up to the top of the hill, that full realisation hit. Already hot and tired, none of us could face such a steep sweaty climb so we turned around and headed back to the little beach area we’d passed a couple of kilometres previously. Note: This hill section is currently closed from Monday to Thursday due to construction work on the new glass suspension bridge. Before we could stop for a well earned picnic, there was just one more challenge that needed to be faced. Dori wimped out but Anne and I bravely walked along the wobbling structure. And back again, because there didn’t seem to be much on the other side and we were hungry. The tiny, shaded river beach at Vau was reward in itself and a quick paddle proved that the water was warm enough to swim in. Note that there’s a car park just above the track at this point but unless there’s a café further up the road, there are no facilities here so bring your own refreshments. The river beach at Areínho does have a café if you make it that far. Even though we didn’t manage the full walk this time around, we were all most impressed and will return for more. The scenery is gorgeous and although the walkway stands out in its newness, it will soon fade in colour and blend into the background. Once the new transparent suspension bridge is opened (due 2019) it will definitely be up there among the best hikes in the world. The initiative enables visitors to visit parts of the countryside that were only previously accessible by boat and should provide a welcome boost to the local economy. 1.8 million euros well spent, we thought, especially since 85% of it is from EU funds. There are SOS phones along the route as well as some information panels to help visitors appreciate the geological features and wildlife. For some reason I don’t understand, a few hundred metres of the route aren’t covered by the walkway – just follow the wooden posts at the side of the dirt track. For this reason alone, you need proper shoes because of the loose stones on the hill and muddy uneven path. Having said that, if you plan to walk the full 16 km round trip, you’ll want decent footwear anyway. 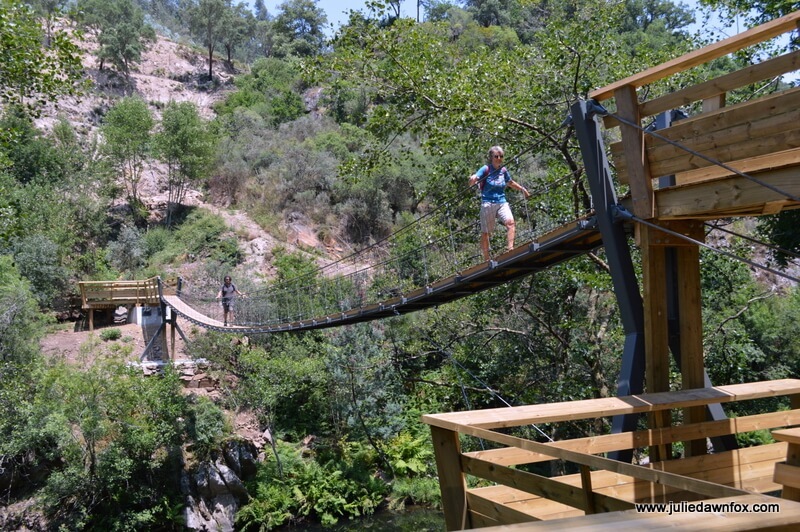 The linear Paiva Boardwalk (a.k.a. Passadiço do Paiva) runs between Espiunca and Areínho via Vau with a big hill at the Areínho end. If you have two cars or are willing to take a taxi back, you could just walk one way. In this case, I’d suggest starting in Areínho to get the hill over and done with while you still have the energy although this is still a challenge for the unfit. If you don’t want to exert yourself too much, I’d start and finish at Espiunca, turning around once you reach the suspension bridge (about 5 km in) and having a rest at Vau river beach before heading back or just go as far as Vau (4 km) and turn around. This way you don’t have to pay for a taxi to get back to your car (approx €15). If you plan to to do the full walk in both directions, I think you’d be best off starting in Espiunca to avoid ending with a hill. You’ll need to buy a ticket in advance (€1, from www.paivawalkways.com) as there is a restriction on the number of visitors per day. If you are driving, be prepared for narrow, winding roads. 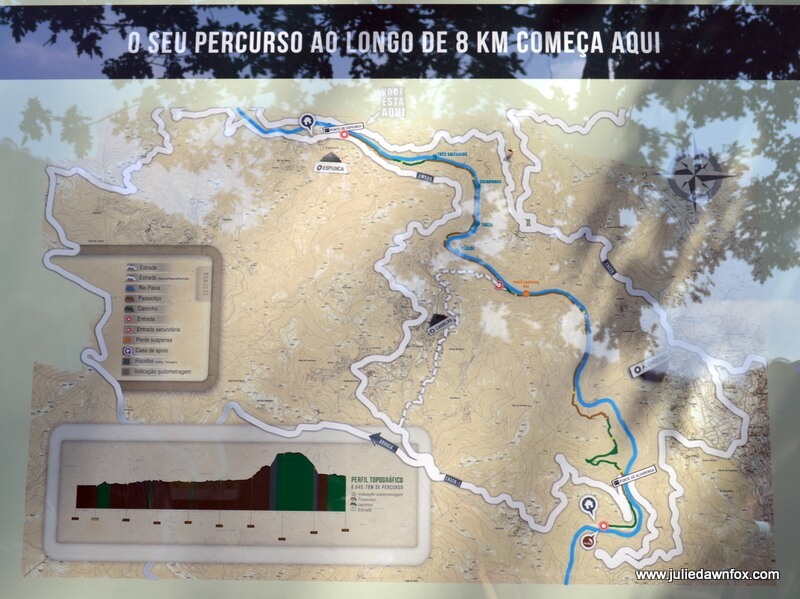 There are parking facilities in Areínho and Espiunca at the start of the walk. If the space by the bridge in Espiunca is full, you could drive through the village and park near the Junta da Freguesia, just after the church. There’s a tiny adega (café) near the entrance to the village where you can get light refreshments and use the bathroom before you start walking. Although some parts of the walkway are shaded, much of it isn’t so you’ll need sun protection as well as sturdy footwear, water and food. If you don’t have your own transport while in Portugal, this one day tour from Porto makes it easy for you to get here to do the walk. Rio Moment’s – About 5 km from Espiunca, there’s a more upmarket hotel with lovely pool and gardens and more facilities and activities on offer, eg. bike hire, watersports, onsite restaurant and a spa. There are plenty of room styles to choose from and it’s pet friendly. From about 200 euros. Quinta de Anterronde – Stay on a 15th century blueberry and kiwi farm with a pool and lovely garden about 7 kilometres from Espiunca. From about 60 euros. Casa do Paul – Right by the church in Espiunca, this tastefully remodelled schist property offers a 3 bedroomed house and duplex studio with simple, clean modern interiors. It’s self catering so do your shopping before arriving as the nearest supermarket is 30 minutes’ drive. From about 70 euros. Is it fair to say that you can do this walk with regular rubber soled street shoes and do not need hiking shoes? Going the uphill route, for someone in pretty good shape, how much time would you say is needed to complete the walk – assuming a normal amount of stopping to enjoy the scenery and take pictures? Hi Bob, it’s boardwalk pretty much all the way so as long as your shoes are comfortable, you should be fine. As for time, not sure, around 3 hours? This looks like a gorgeous walk. I’d really have to talk myself into crossing that suspension bridge! I didn’t think it was too bad, really. I suppose it depends on how sturdy you like the ground beneath your feet to be. It’s a bit wobbly but not exactly swaking in the wind. Thanks for this, Julie. Diana and I did this walk some years back, before the creation of the walkways and it was pretty long and gruelling, but well worth it. 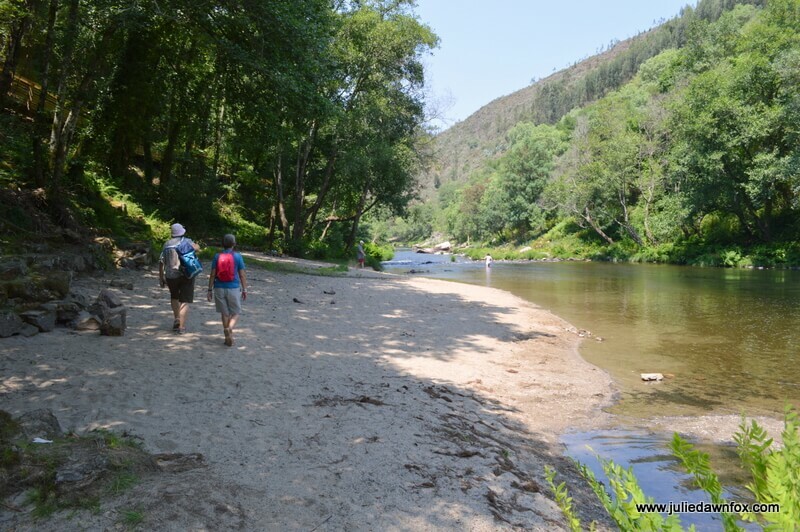 We’ll be back soon to try the new one – and maybe some of the many marked trails in the “conselho” of Arouca. Hi Robert, the old PR9 still exists, and crosses paths with the new walkway, I think at the point where the boardwalk has a gap, so your original walk may not have been ‘spoilt’ by this one. I have got a leaflet for the PR9 and it does look quite a challenge! 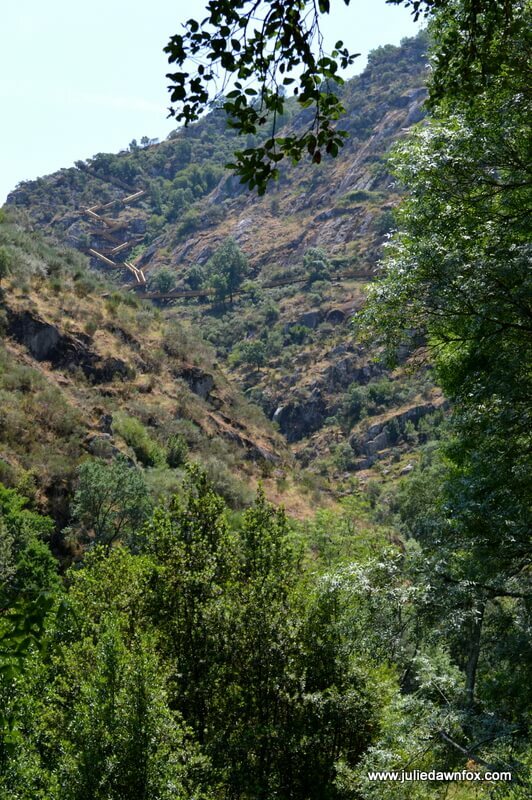 I’d love to check out any easier Arouca walks though – I managed to pick up some trail leaflets from the Arouca Geopark stand at BTL but I’ve yet to try any of them.